Giant Leap Consulting | Bill Treasurer – Courageous Leadership | The Leadership Killer is Available for Pre-Sale! The Leadership Killer is Available for Pre-Sale! Will You Survive Leadership Success? This question does not get asked nearly enough, though it should be a part of any leadership program, column, or book. Those who aren’t equipped for the challenges to humility that accompany success, they often find out the answer to this question too late. Almost every day a news story breaks about a leader in industry, politics, or entertainment who has misbehaved and taken advantage of his power. This is the result of hubris, dangerous overconfidence which has told these individuals that they are special and better than others and so can act in ways that “normal” people cannot. Of course, these types of leaders are always doomed to fail—putting yourself ahead of those you’re supposed to be leading is a guarantee you’ll be on your way out before long—and depending on how notable their organization is, we all get to watch their fall from grace. It’s a shame, we often say, to see good leaders go bad. But they don’t have to. With the right tools, knowledge, and mindset, hubris can’t touch even the most successful of us. 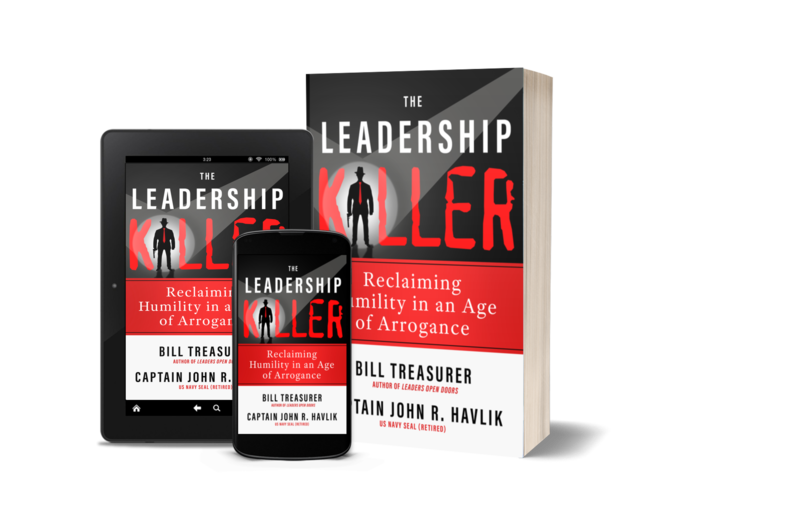 That’s what me and my good friend—Captain John Havlik, US Navy (retired)—set out to teach with our new book, The Leadership Killer: Reclaiming Humility in an Age of Arrogance. The Leadership Killer provides tools for beginning and rising leaders to learn how hubris can take hold, how to keep it in check, and how to remain confident without being arrogant. Filled with firsthand insights on our own successes and failures as leaders, lessons to be taken from other leaders (both those who have conquered their hubris and those who let it get the best of them), and actionable tips for remaining an effective and humble leader, John and I wrote this book to warn tomorrow’s leaders of the dangers of ego-based leadership and to give them a fighting chance to beat back arrogance when it rears its head. John and I met almost 40 years ago on the swimming team at West Virginia University, and though our careers diverged significantly after graduation (me in the private sector, consulting for various companies and then starting Giant Leap, and John in the Navy, eventually joining various elite SEAL operation teams during his 31-year naval career), we came together to write this book to address what is clearly an increase in leadership arrogance out everywhere you look. Leaders are wreaking havoc not only on the people that rely on them, but on their own careers due to poor, ego-driven choices. No one starts this way—hubris is the trenchcoat-clad figure quietly following behind success, waiting for a chance to strike, and with this book, readers will be able to steer clear of its attempts to ambush them. I hope that you or a leader you know can use The Leadership Killer as a guide through the tricky side-effects of leadership success—please let us know via our contact page how it helps you! The Leadership Killer is on pre-sale now in both paperback and digital formats, and will be released on October 30th.